I've been thinking about family lately. It's kind of the thing to do in the Christmas season, plus we're having our first college-employee Christmas break, so we're actually back in Washington state, visiting our families. I don't have the most closely knit family. My brothers and I don't call or write, even though I think they're awesome. It's not a lack of liking one another, it's just that life is all-consuming. And so Christmas, and Easter, and a couple of other gatherings during the year are the sum of our relationship with each other. It makes the holiday extremely important. But some years it didn't happen. Some years, we lived all the way across the country. Money was tight, and we decided it was better to visit in the summer, when the outdoors was going to be more inviting. It wasn't a bad choice, it just made for a glum Christmas Eve. We would fancy up for the church holiday programs, bake and plan and sing and celebrate. And then, for the day itself, we were alone. All of our local loved ones went home, and spent time with their real families. Christmas Eve is a sorter of priorities. It's a reality check. Like thousands of other pastoral families, we poured our energy and time into the church. We had relationships and meaning there, and people we loved. * But when the holiday comes, all the lesser relationships have to give way to the most important. Those Christmas Eves on our own were invaluable, because they showed me the lay of the land. Here's what I learned--there is no work you can do, even work for the church, that will keep you company on Christmas Eve. That space is saved for relationships, and it's mostly family that makes the cut. It's the ultimate test for how you spend your time, who you give your best energies, where you look for your identity. 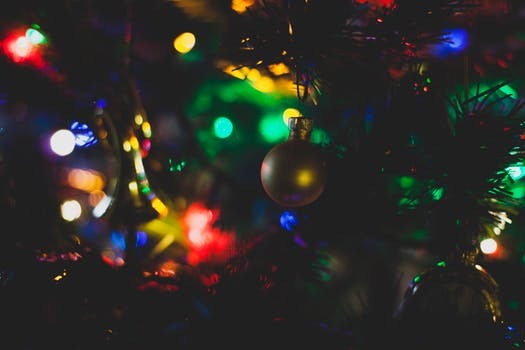 We can waste a lot of our strength chasing things that fade to insignificance under the colored light of the Christmas tree. I don't mean to suggest that there's only one way to be happy. I wouldn't want to imply that if you don't have good family relationships you're doomed to misery. Only that we need to value what we do have. Because life is busy. All-consuming, in fact. Our pace of life can keep us filling the days with what's immediate, instead of what's meaningful. The real meaning of Christmas is who loves you most. The good news is there is always a Father who loves you most, even if your family relationships are bunk, or you've failed the Christmas Eve test. Our relationships are his gifts, the tangible expression of his love to us. But with or without them, you are never alone. So this Christmas, take some time to consider life, and meaning, and priorities. Take a break from the baking and wrapping, and sit a while in front of the lights. Experience the gift of being loved. *And if any of our much-loved church friends are reading this, please don't feel sad for me. I am glad that you had the right priorities. The sometimes sort of reliable weather guys up here are predicting snow for Christmas. This is a risky prediction since, at least here in Western Washington you could predict "drizzle" every day and have an 85% accuracy prediction. Hope you are in the part that gets some snow while you're over here. We're visiting with my wife's estranged sister and brother-in-law tonight. Healing old wounds. That's what Christmas and Thanksgiving are really for - embracing families and setting aside old hurts. Family is in many ways who we are. Our childhoods are the most vivid memories we have. Those years form our character. Sometimes for the better; sometimes not. Jesus often takes an entire lifetime to help us get over our youth. It's little wonder that some parts of our memories must be erased when we are made immortal. I like to think we will keep the memories we come to terms with in this life. I want to know the people I love faults and all. I want to learn to cherish them flaws and all, knowing that these people have helped make of me the foundation upon which Christ has built. I am grateful to them all. Merry Christmas. Enjoy your time in Washington State. Hope you get a white Christmas.